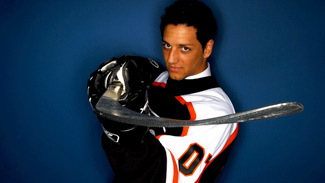 Versus has announced its 2009-10 NHL television schedule, which features the large-market Flyers a total of eight times. The first nationally televised contest for the Orange and Black is the team’s home opener on Oct. 6 against the Washington Capitals. Oct. 6 — Washington @ Philadelphia – 7:00 P.M.
Nov. 16 — New Jersey @ Philadelphia – 7:00 P.M.
Dec. 8 — Islanders @ Philadelphia — 7:00 P.M.
Dec. 15 — Philadelphia @ Pittsburgh — 7:00 P.M.
Feb. 8 — New Jersey @ Philadelphia – 7:00 P.M.
Mar. 2 — Philadelphia @ Tampa Bay — 7:30 P.M.
Mar. 9 — Islanders @ Philadelphia — 7:00 P.M.